Swell, We Got A Bleeder! UPDATE 1-10-18: Currently seeking Guitarist and Vocalist. Have drummer and myself on bass to do a no pressure for fun cover band of many of my influences listed below. Jam once a week and eventually a gig or two a month type of situation. "I’m not a background player. I never have been, and I never want to be the guy who hangs out by the drums and just walks the dog. I like to write impact-full parts and rock them out. There’s no reason the bass shouldn’t be right up front." "Ever since I was a kid, I always wanted to play music that I liked, and even when I was in cover bands when I was a teenager we only played cover tunes that we liked. That was the simple morality that I grew up with." I'm thinking more of a weekly band to have fun, but who knows where that could go with a couple gigs here and there about once a month. More time could definitely be dedicated to the project if it works as I work full time/family during the week days. The sounds attached are from my page of the same profile name. Bits and pieces from previous bands, recordings in my bedroom of ideas for song arrangements, etc. Send me a message if anything you see looks interesting to you! Tool, King Crimson, Yes, Rage Against the Machine, Helmet, Feersum Ennjin, Lesser Key, Dif Juz, Porcupine Tree, At the Drive In, Pat Matheny, The Morning Benders, A Perfect Circle, Metric, Jaco Pastorious, Agitation Free, QOTSA, The Mars Volta, Can, Michael Hedges, Hum, Zoe, White Lies, Lusk, The Deftones, RHCP, Incubus, Janes Addiction, AIC, Soundgarden, Nirvana, Metallica, Pearl Jam, Stone Temple Pilots, Temple of the Dog, Mad Season, Sublime, Foo Fighters, Kansas, The Who, The Beatles, Led Zeppelin, Black Sabbath, etc....and I have tons more...just ask! 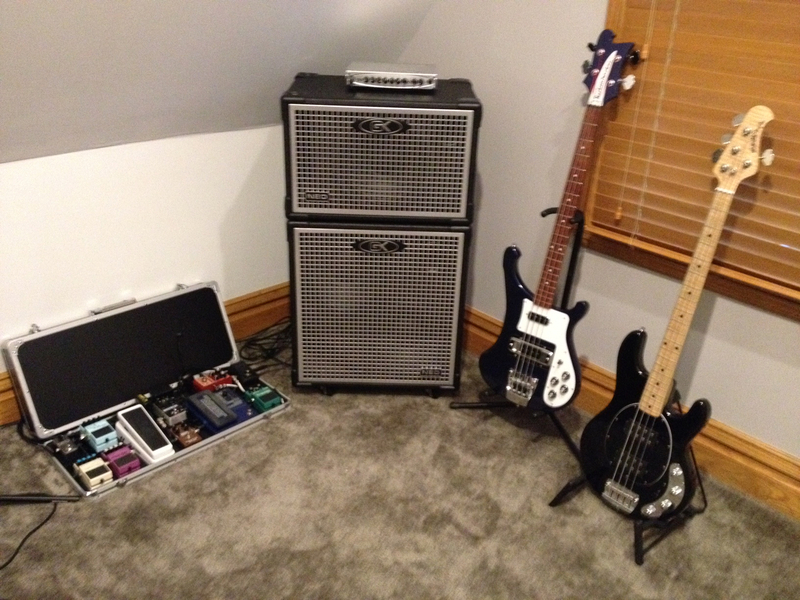 Musicman Stingray 4HH, Rickenbacker 4003s, Modified Squire Affinity PJ with Geezer Butler EMG's & High mass bridge, Ampeg Micro VR amp and cab, Tech 21 VT Bass, digitech Bass Whammy, MXR bass fuzz, EHX Glove OD, MXR Bass Envelope, Boss Flanger, bass chorus, tremolo, digital delay, bass enhancer, an Epiphone SG 1966 400 Pro, Line 6 Spdver IV and other recording gear. WordsA new track I created, needs a lot of work on the timing here and there. I did all instruments on the track. Never The LessAn idea I previously created. A friend of mine Mike Cohen came up with the excellent guitar work. I played bass, synth, and controller drums. MudI am responsible for bass part and arrangement. Grant Kugman on guitars and Gar Torres on hand percussion. Aeroplanerough demo cover of Red Hot Chilli Pepper's Aeroplane with my old band. I played bass on the track. Stinkfistrough demo cover of Tool's Stinkfist with my old band. I played bass on the track. RevivalDone with my previous band. I take no credit other than the bass line and arrangement. Queen VioletDone with my previous band. I take no credit other than the bass line and arrangement. CrypticSomething I put together in Reason several years ago, Pretty Hate Machine inspired!